Good or bad for you? David Michaelis discusses the benefits and concerns of exergaming by citing two opposing studies and puts his own spin on the situation. anewdomain.net — As the reality of active gaming grows, the theoretical question of how good, healthy, or productive are video games begins to see some new light. Obesity and related health consequences stand large in the nation’s issues, and I wonder whether or not these new exergaming exercises are really enough for children. Passive pastimes, such as watching television and playing video games, are often an easy option for parents. But for their children, who need frequent physical activity, embodying a potato is not enough. The gaming industry has supplied a solution in “active” video games. Is it as healthy as the alternative? Let’s take a look. Leon Straker — professor at Curtin University in Perth, Australia — set out to see how children spent their time in the absence of video games. He also questioned whether the newer, more active video games were better than both passive games and traditional exercise. Straker’s laboratory studies show that children are sedentary when playing traditional “press button” video games. Their heart rate and activity levels are roughly the same as watching a DVD. However, when they played “active” video games such as Sony PlayStation Move, Microsoft Kinect and Dance Dance Revolution, Straker found a significant increase in their energy expenditure. The exergaming, according to his findings, were on par with activities like jogging and basketball. But until now, we didn’t know what happened when we removed video games from the equation all together. Overall, Straker thinks that “active” games might be as healthy as no video games at all, based on his peer reviewed publication below. ‘Objective: To evaluate the impact of (1) the removal of home access to traditional electronic games or (2) their replacement with active input electronic games, on daily physical activity and sedentary behavior in children aged 10–12 years. The Setting was Family homes in metropolitan Perth, Australia from 2007 to 2010. Participants: 10-year-old to 12-year-old children were recruited through school and community media. From 210 children who were eligible, 74 met inclusion criteria, 8 withdrew and 10 had insufficient primary outcome measures, leaving 56 children (29 female) for analysis. Playing active video games doesn’t lead to increased overall daily physical activity levels. 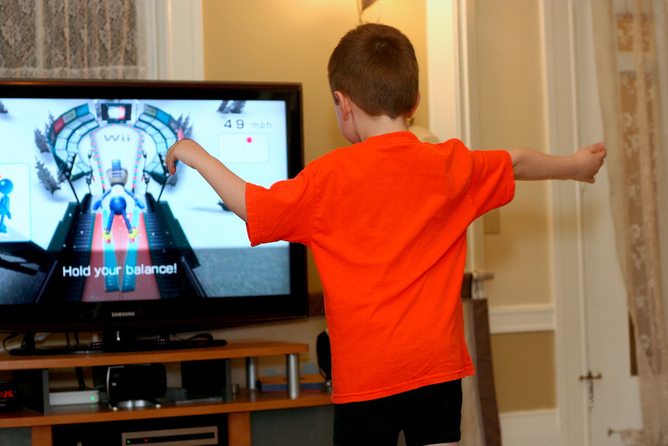 Active video games may get heart rates up, but they’re not significantly helping kids get to the 60 minutes of moderate- to vigorous-intensity physical activity required each day. Kids find active video games appealing, but the appeal wears off over time and many don’t stick with them. Active video games don’t offer the fresh air, vitamin D, connection with nature and social interactions that come with outdoor active play. You can view the whole video, which provides a more comprehensive analysis of the issue, here. The amount of time children spend watching television hasn’t changed much in the past ten years, from three hours a day in 1999 to just under that in 2009. But the amount of time they spend playing video games has risen rapidly from under 30 minutes a day a decade ago to between 30 minutes and 90 minutes daily. Video games have changed significantly over the years. From crude incarnations that required players to press arrow keys and navigate slowly to touch screens, joysticks and dedicated game consoles, the field is forever moving. The health effects of video games will always be up for debate, but it is clear that as exergaming becomes more popular and more fluid, the chance of healthy gaming is a possibility.